Heavenly Divine Rosaries Link to Us! All our handmade beaded necklaces come with either a sterling silver or gold-filled charm pendants on an 18" plated chain in a deluxe gift box. 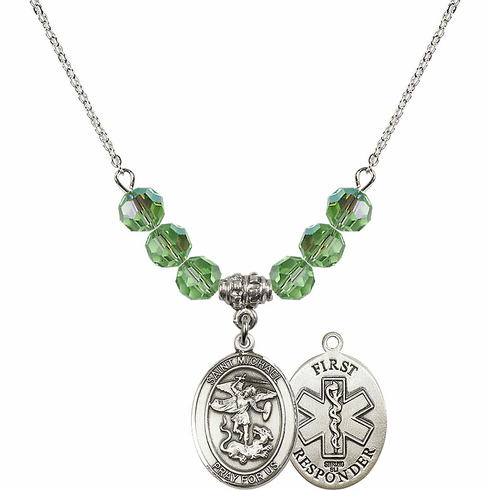 We carry a large selection of Christian charms and medals to choose from; crucifixes, crosses, patron saints, hearts, miraculous medals, military, sports, four way crosses, First Responders, fireman, nurses, doctors and birthstone medals. You can choose from a variety of beads like; Swarovski beads, Faux-Pearls, Sterling Silver beads and Gold-filled beads. Our charmingly faithful necklaces are made in the USA by Bliss Manufacturing. All of our Christian jewelry comes with a lifetime guarantee against breakage and tarnishing. Available: Swarovski Crystal, Faux-Pearls, Sterling Silver and Gold beads. This web site is dedicated to the Holy Family. Copyright 2007 - 2019 Heavenly Divine Custom Rosaries And Gifts All Rights Reserved.